A celebration of life will be held in honor of August (Gus) De Hertogh on Saturday, March 16, 2019, from 3 – 6:30 pm. It will be held at the JC Raulston Arboretum in Raleigh, North Carolina. A memorial tribute has been established with AFE. It is our hope to raise $50,000 to establish an annual named Scholarship Fund to honor Gus. Click here to donate. The family will be notified of all contributions. August (Gus) De Hertogh, Ph. D. passed away on October 26, 2018, at the age of 83. Dr. De Hertogh was an internationally renowned researcher and expert in the industry, specifically, revolutionizing forcing bulbs as pot crops on a global scale. 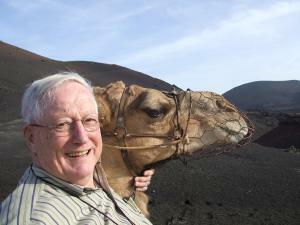 He served as AFE’s first Research Coordinator from 1999 to 2014. 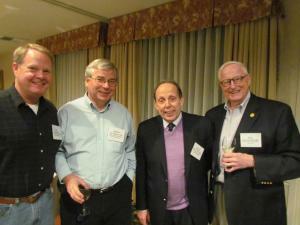 Gus was raised in Chicago and began his career in neighboring Michigan, at Michigan State University, in 1965. Here, he worked with Dutch exporters on tackling challenges with flower bulbs. At the time, it was not yet possible to effectively control the flowering of tulips or other bulbs following overseas shipment from The Netherlands, the world’s largest producer. They began what is known as the Flower-Bulb Project, a collaborative effort between the Dutch Bulb Exporters Association and the Department of Horticulture at Michigan State University. For the next 35 years, he would continue to research flower bulbs. 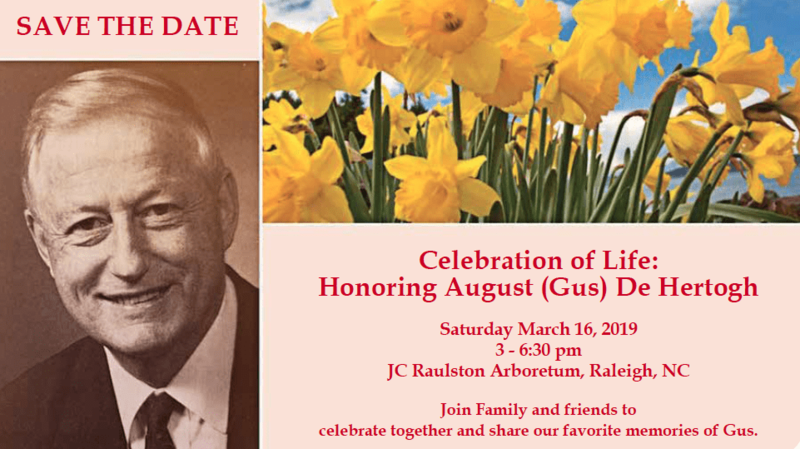 In 1978, Gus relocated to Raleigh, North Carolina, where he would serve as the chairman of the Department of Horticulture Science at North Carolina State University for the next 10 years. All the while, continuing his research on flower bulbs. As Research Coordinator at AFE, Gus helped to establish and oversee the most comprehensive research proposal review process in the industry. The four-step review process ensures that projects funded by AFE are relevant to the floriculture industry, carry the highest priority, are conducted by the leading scientists in their field, are fiscally responsible and meet or exceed AFE’s expectations. Throughout his career, Gus received many notable recognitions for his work in the industry. Those who know him use the word “icon” to describe his impact on the floral industry. Gus is survived by his wife Mary Belle, children Mark, Michelle, Jennifer, Mary Moore, Susan, Jay; Grandchildren Mark, Lori Beth, Drew, Patrick, Aaron, Claire, Addison and great-granddaughter Caroline.